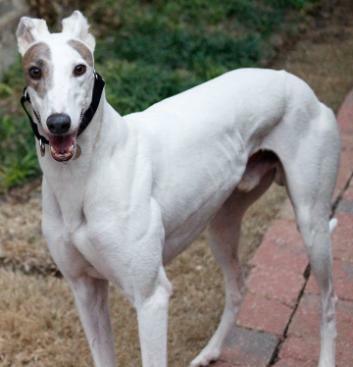 History: Whiskey (Whiskey Hangover) is a recent retiree from racing at Gulf Greyhound Park. You can tell that by looking at the amount of muscle he has!!! That boy is ripped!! 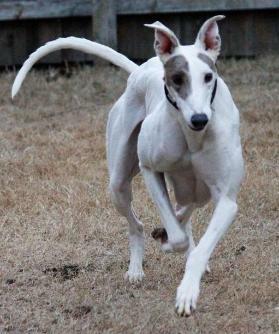 After a respectable racing career, at 3 ½ years old Whiskey is ready for a slower pace of life. 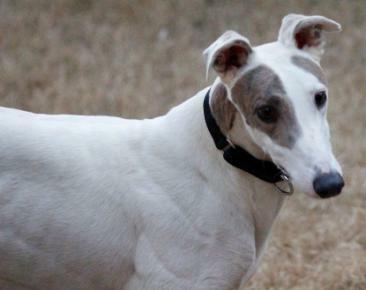 Whiskey’s good looks and abilities come from his famous pedigree (TNT Star Wars, Fortress and Gable Dodge). It may take a day or two for Whiskey to settle in and become accustomed to the good like in a home. 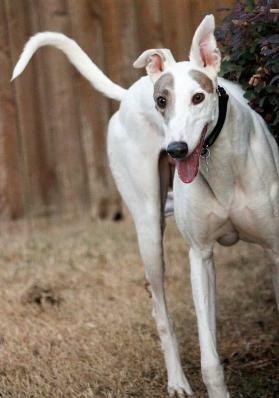 Whiskey was adopted by four greyhound siblings, Dasher, Spot, Carmen and Flower, and human dad Rock, and is settling into his new pack. January 14, 2013 update: Whiskey came to us on Friday evening, January 11, 2013. He was so nervous and stressed. He had never been in a house. He kept us up all night panting and pacing. It was a long night for all of us! The next morning it was like he'd figured out this new life wasn't so bad - a little food in his belly, a run around the yard, a few treats here and there, a nice soft bed to curl up on and people to scratch behind your ears whenever you walk by them. By Sunday, Whiskey was just another member of the family. He wears a belly band, and we are working on house training. Neutering usually helps with the training. He's a smart dog and learned quickly that counter surfing is not allowed. He's still learning about not jumping up on people - he gets excited and wants attention. He seems to be cat trainable. He's got a few good sniffs, but "No cat!" quickly redirects him. He enjoys being around the 2 greyhound girls in our house. He knows that they are the boss so he follows them around to learn the ins and outs of the house. Whiskey has also done really well with the 2 small dogs in the house. Whiskey has slept all night on the dog bed in our master bedroom. 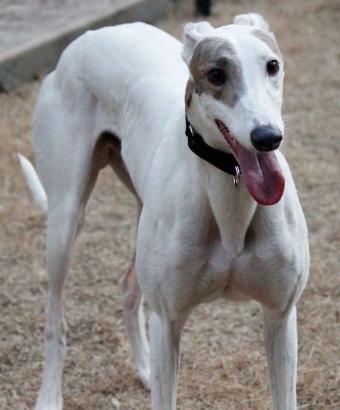 Whiskey is on his way to making a greyt companion! January 11, 2013 update: Whiskey started a new life of retirement by coming to TAGS to find his lifetime home.